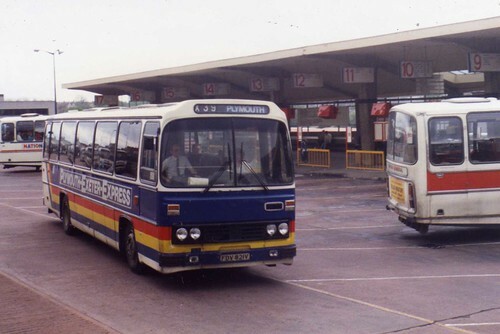 Leaving the bus station is this colourful Willowbrook bodied coach for Western National in 1986. In the design philosophy of the time; "Slap it on big, whatever", the side of the coach tells you about route X39. Its been a while since I did one of these and many excellent photos have been posted online recently. Aecregent never fails to come up with the goods and I particularly like this shot as it features the smart livery (I know many disagree with me!) that was introduced after NBC Green - following on from the Hoppa livery carried on those horrible Mercedes bread vans. These Willowbrook bodied coaches were not good to look at and I never felt they were that comfortable either but they were the mainstay of the Exeter - Plymouth / Torbay routes for quite some time. As much as I wasnt a fan of these coaches they were a lot better than the Mercedes minibuses which were introduced on the X38 by Devon General in the very late 1980's.